2016/17 Upper Deck SP Game Used Hockey Hobby Box mit 1 Packs Per Box, 6 Cards Per Pack. In jeder Box: 1 Autogramm oder Premium Memorabilia Card plus 3 weitere Autogramme oder Memorabilia Cards ! Produktinformationen "2016/17 Upper Deck SP Game Used Hockey Hobby Box NHL"
Find Two Base Cards or Authentic Rookies Per Box! Find an incredible lineup of cards featuring game-used jerseys, patches, pucks, sticks, gloves and net cords from the 2016 NHL Stanley Cup Final, Winter Classic, Stadium Series and NHL All-Star Skills Competition. Look for 100 Base Cards and 100 Authentic Rookies serial #'d to the featured player's jersey number. Plus, select player cards serial numbered to actual jersey number will feature an autograph with accompanying COA to create 100 must-have 1 of 1 cards. 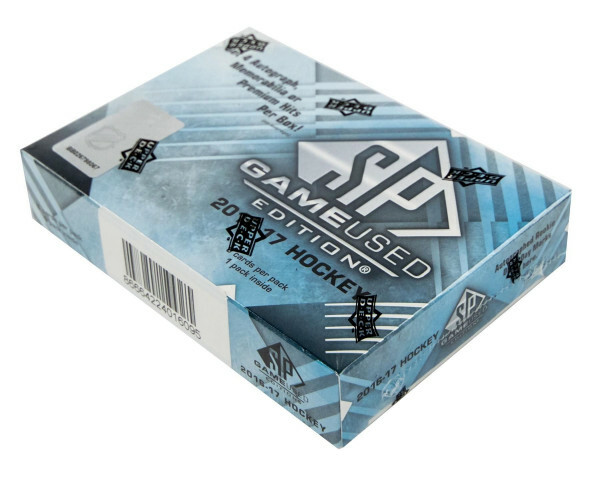 The return of huge hits like Game Gear, All-Star Skills Game Gear and Stadium Series Game Gear along with, Supreme Patches, Supreme Gloves and Pads feature a selection of the game's top stars with massive 1" x 2.75" swatches of super-premium, game-used material. NEW! Brand New Frameworks cards feature a large jersey swatches of many of your favorite players, displayed in a way you've never seen before. Weiterführende Links zu "2016/17 Upper Deck SP Game Used Hockey Hobby Box NHL"
Fanbewertungen für "2016/17 Upper Deck SP Game Used Hockey Hobby Box NHL"